The double balanced mixer is a diode bridge mixer that uses two single-ended to differential transformers, or baluns, to create the multiplication of two input frequencies and cancel many of the unwanted harmonics and signals. Most notably is the cancellation (ideally) of the local oscillator and the input at several harmonics. NOTE: The design section is for educational purposes. The final design is fixed as a standard double blanced mixer with packaged diodes and two baluns. NOTE: The assembly of the mixer is done on a partially pre-fabricated board, which will have the layout of the balun and diodes pre-done. This is due to the tight tolerances of the layout of the parts. You will have to add the top layer ground planes and conductors to SMAs using hand-cut foil tape. The design of your mixer will be in two parts. The first is simulation and the second is layout. 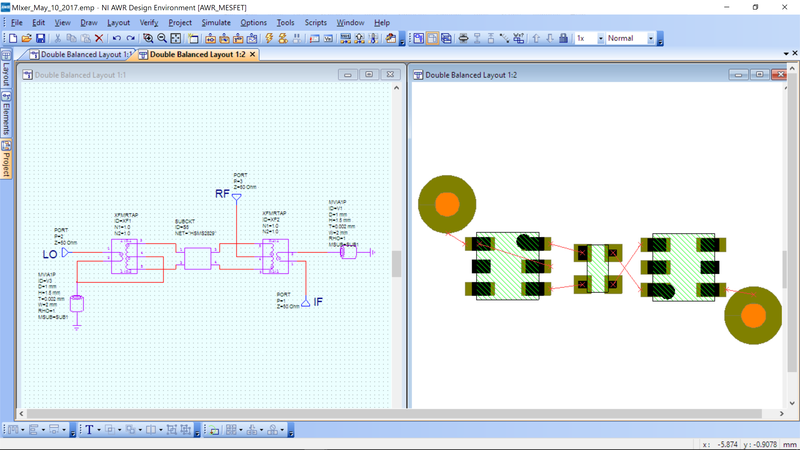 The diode you will use in simulation is a different symbol than will be used in layout. 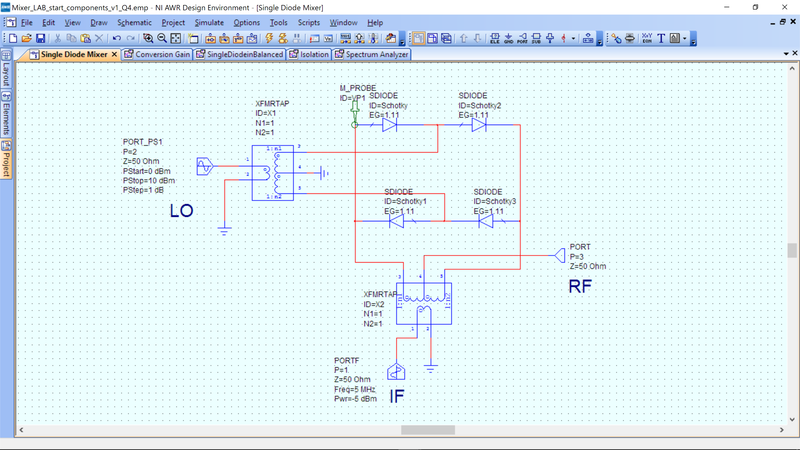 This is because in layout, we will use an IC that has 4 diodes inside it. Below are the components that you will need for simulation. These have been enabled them so that you can see them. 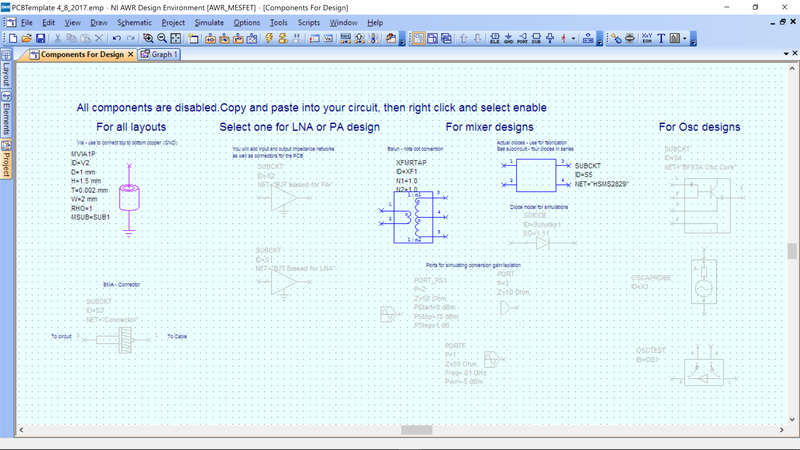 The template component can be found through the left folder/tab (not the top menu): Project->Circuit Schematics. 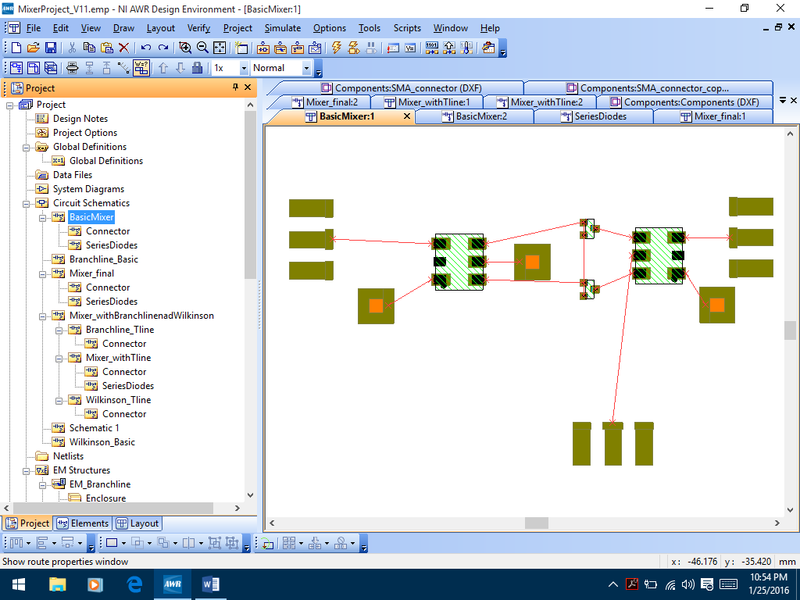 Create a new schematic from the menus on top: Project->New Schematic. Name it “double balanced mixer”. 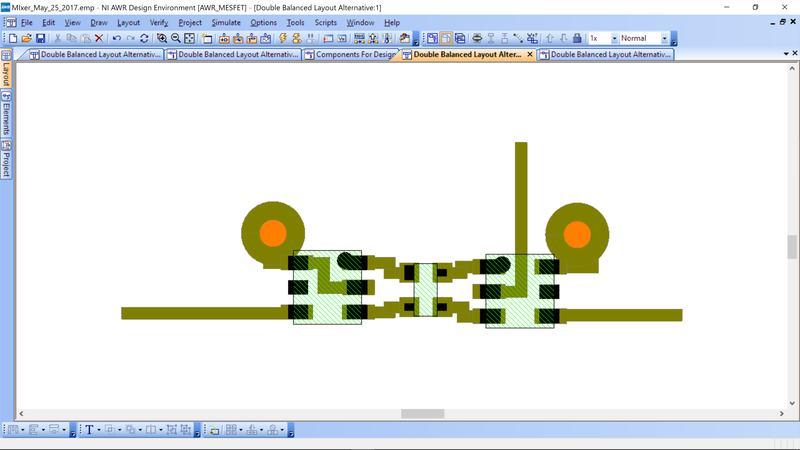 Return to the template and disable the components (as they are not connected and could prevent simulation). 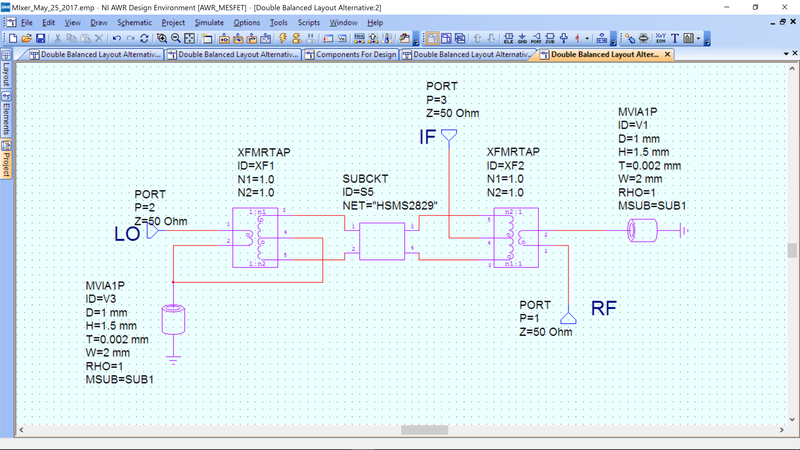 XFMRTAP – This is a simple transformer with turns ration n.
PORT_PS1 (P=2) – This is a 50 ohm port, like a VNA, that will sweep the input power from PStart to PStop in PStep. In this design we use 0 to 10 dBm in 1 dBm steps. PORTF (P=1) – This is a 50 ohm port, like a VNA, that has a specified frequency and input power. It is set for 5 MHz and -5 dBm. PORT (P=3) – This is a 50 ohm port, like a VNA. It does not have any input power, but rather is used for measuring and 50 ohm termination. 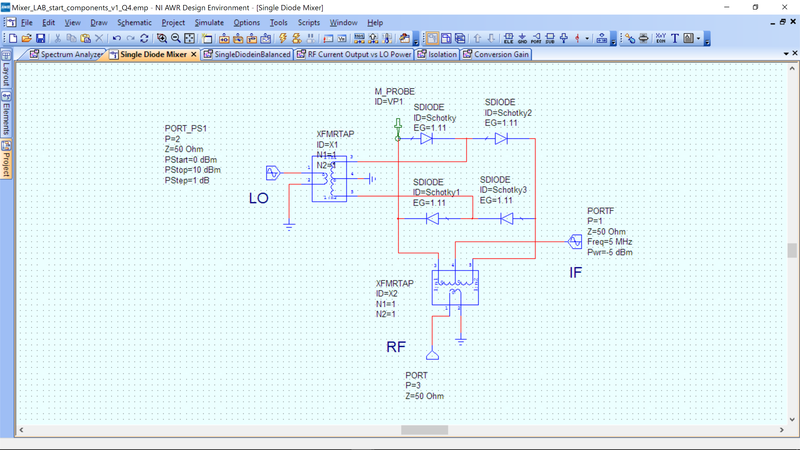 M_PROBE – this is a measurement probe that can be added from the top menu. Note: the probe is on the pin of the diode, not the net (this is so it will measure current). Please make sure the ports are using the same numbers as the example (P=#). Start with P=1. The software requires that the ports be sequential and start from 1. See the bullet list for the port number for each port. For Simulation Only: we will use the frequencies of the example in the Theory of Operation for educational purposes. The double balanced mixer does not have any narrowband components, and therefore works over a broad bandwidth. We will simulate at 105 MHz, however it will operate properly in our radio at 950 MHz. The frequency of the LO port, PORT_PS1, is not explicit but rather is implicit and is set by going to Options->Project Options and selecting the Frequencies tab. Select Single Point then type in 0.105 (units are GHz, so this is 105 MHz) in the Point box and hit the Apply button. The frequency of the IF is set explicitly in the port definition of PORTF at 5 MHz. The frequency at the RF port, P=3 is not set, as this will be our output. To start, we will examine the currents in one diode to see the different harmonics that are present. To simulate, we first need to create a graph. 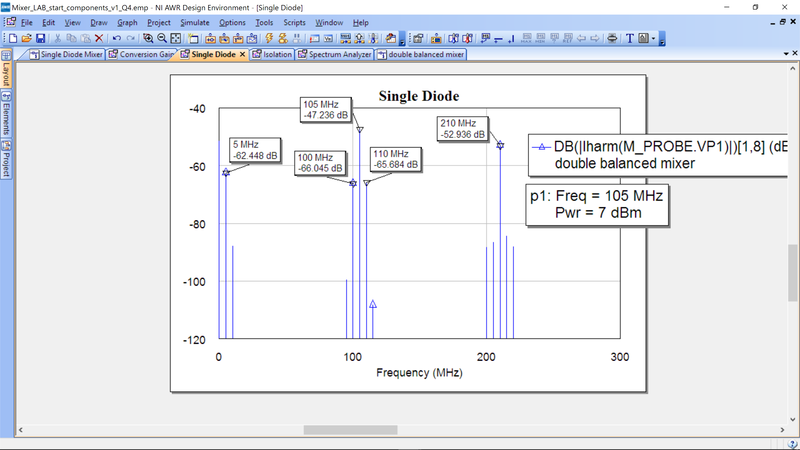 From the top menus: Project->Add Graph->Rectangular and label is “single diode currents”. Data Source Name: Select the name of your mixer schematic “double balanced mixer”. Make sure it is not All Sources (default) or one of the other subcircuits in the template. Measurement Component: Select M_PROBE (this will measure the current at the probe). Make sure M_PROBE is on the pin, not the net! 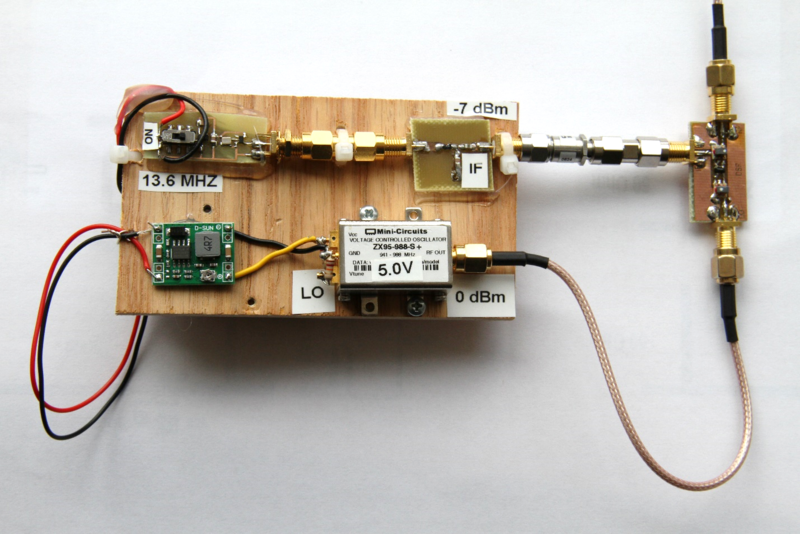 Sweep Freq: 105 MHz, this will use the project options you setup earlier for 105 MHz. PORT_2: the setup sweeps the power on the LO port. Set this to 7 dBm for a fixed LO power. 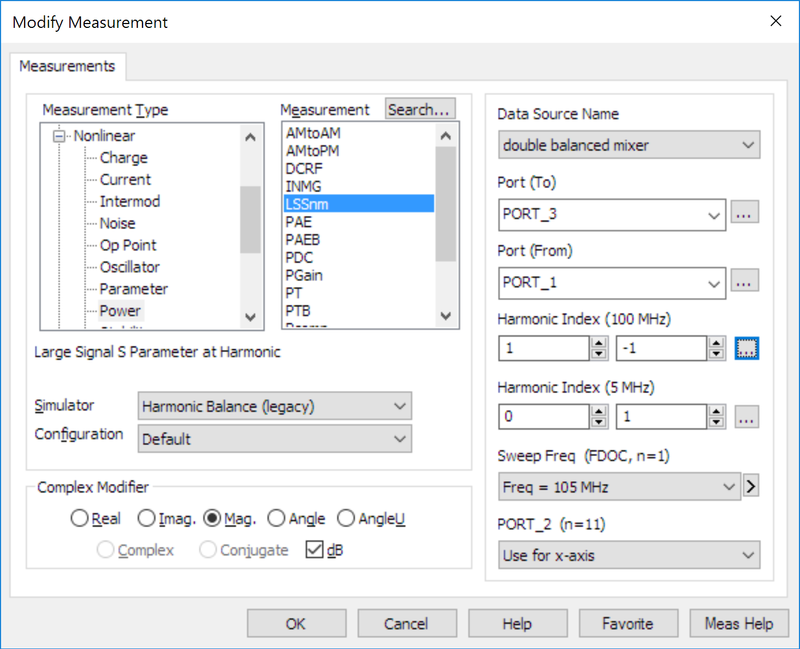 Simulator: Harmonic Balance – this will simulate the 105 MHz and all sums/difference harmonics. Hit the simulate button (the lightening bold on the top menu). The results are below. The current harmonics are almost identical to the single diode mixer in the Theory of Operation. We are now measuring the power at PORT P=3, which is our RF port. The LO and IF have disappeared, just as in the example in the Theory of Operation. 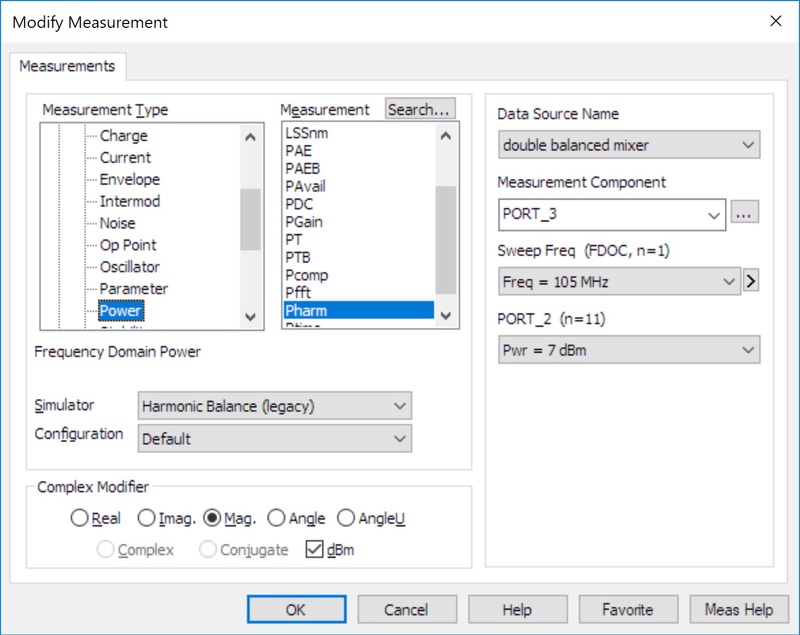 You can add two more measurement to measure performance over input power. The RF and IF ports are interchangeable. 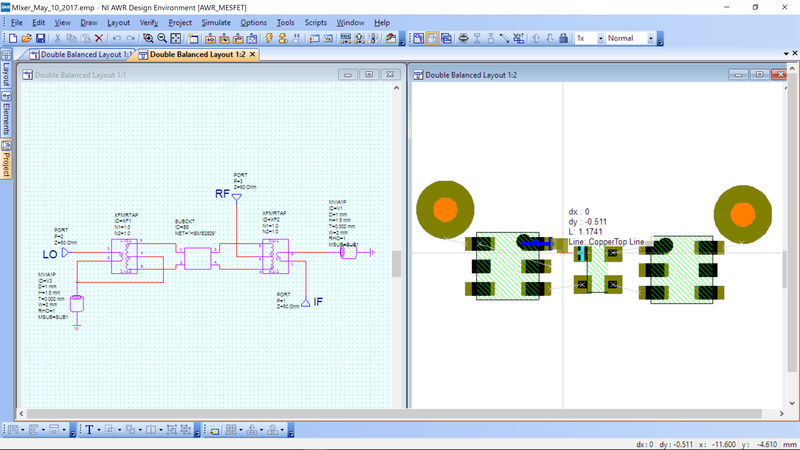 To illustrate this simply swap the ports on your schematic as below and re-run your simulation. You should achieve the same results. 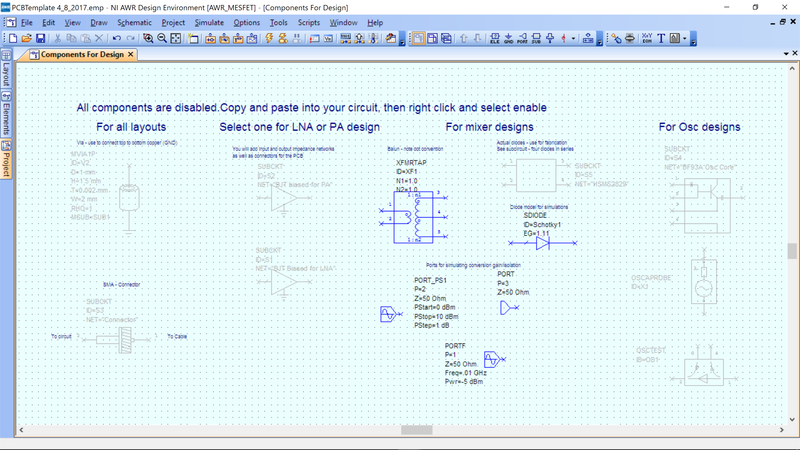 Reset your schematic to its original (Ctrl-Z should undo your swapping of pins). This is to ensure pin names are correct for instructions below. Add another graph with the following measurement. This is measuring the large signal S parameters from IF (P=1) to RF (P=3). The Harmonic Index tells the graph which harmonic to plot. The -1 and +1 are indices for the harmonic. If you click on the “…” shown in blue above, a window will appear. 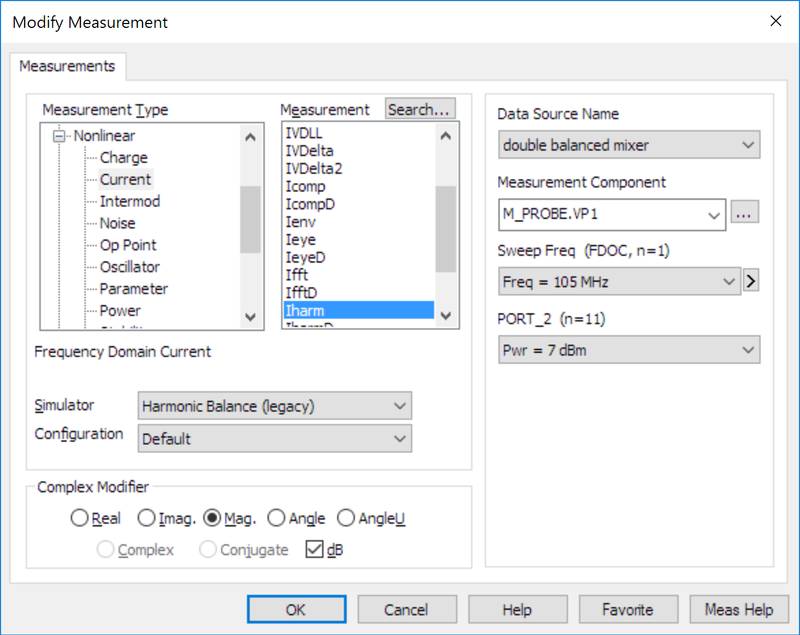 Select the 100 MHz harmonic, and the indices will be selected on top for you. The meaning of the indices is not needed for this project, you just want to ensure you will plot the 100 MHz harmonic. Note: we could have also plotted the 110 MHz component, as it is the other sideband of the RF signal. Likewise, we select 5 MHz for the bottom Harmnoic Index as that is the harmonic of the input. The logic of which one to select, is just top-down, since PORT_3 is top, the top Harmonic Index is 100MHz. The bottom is PORT_1, and so the bottom Harmonic Index is 5 Mhz. Both match the ports they refer to. The only other change is for PORT_2 – change this to “use for x-axis”. Note: you may have to scroll UP to get to it. This setting will plot the PORT_3 signal (RF) power at 100 MHz corresponding to the 5 MHz input at PORT_F (IF) versus LO power on PORT_2. 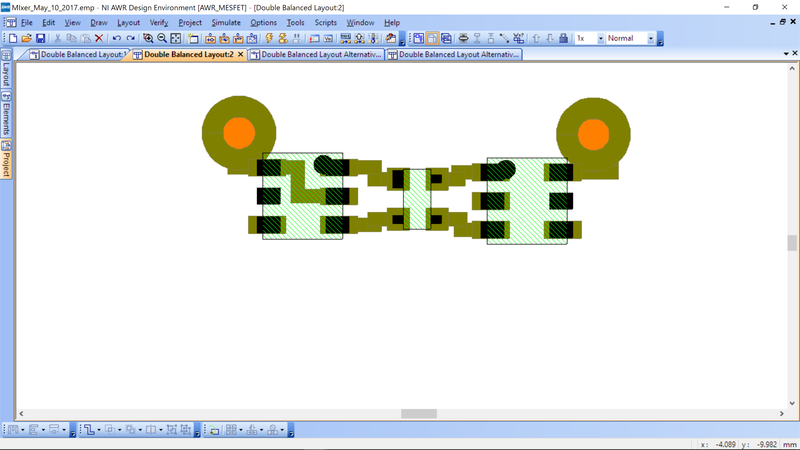 The components you will need for layout are shown below. 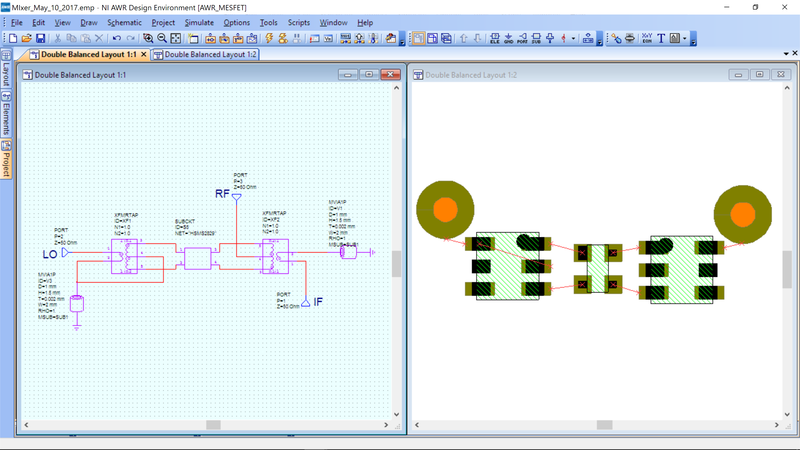 Create a new schematic and call it “double balanced layout”. 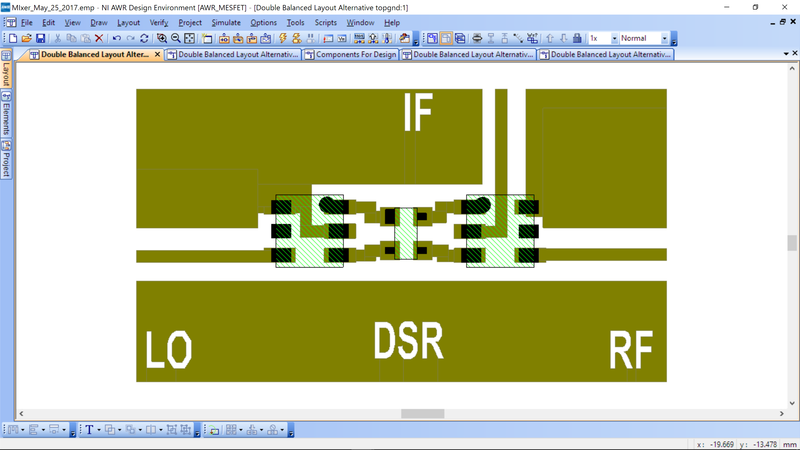 This is not normally required, but since our layout parts are different than our simulation, we need a second schematic. Setup the schematic as follows. Note that the two ports of the left balun are tied to the same via. This is because in layout the routing will be easiest to do to a single via. Ports have been added for clarity – we will not simulate this schematic as the HSMS2829 does not have an underlying mode (it is just for layout). We need to add layouts to the baluns (XFMRTAP) and the HSMS2829. In your schematic diagram right-click on the diode component (HSMS2829) and in Properties>Layout select the Diode_HSMS2829 footprint. Make sure the “Component” library is selected. 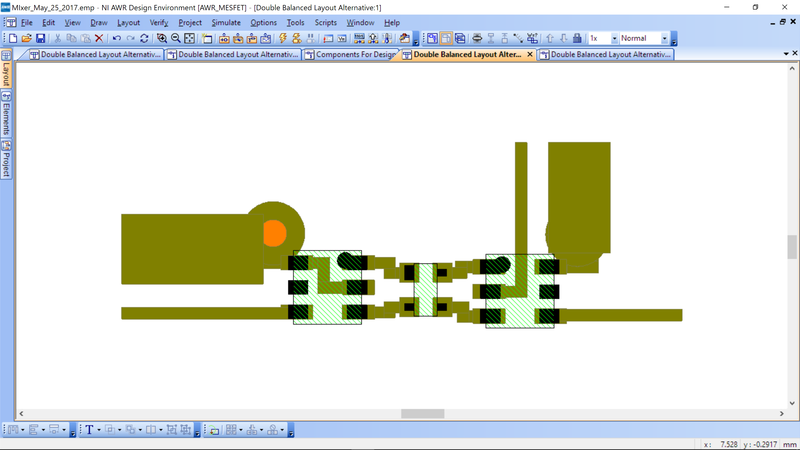 Now Select the two Baluns and Right-Click, Properties>Layout select Xfrm_MiniCircuit_TCM4 footprint. Using the top menus, View->View Layout. Your components will appear. Move them into a logical orientation. You can rotate a component by Right-mouse Click->Rotate (you can also flip with the same menu). Using Window->Tile Vertically, you can place the schematic next to the layout (which ever one his selected when you do this, will appear on the left side). Here is the schematic and the parts logically placed. The red lines indicate connections on the schematic. The round circles are the vias you will drill and fill by hand. They can only be grounds (no routing on the bottom layer). There are two apparent problems: 1) the via on the bottom left requires a connection that appears to cross with the signal to the diode bridge. 2) The balun on the right appears to be crossed. The first one can be solved by routing under the part, through the middle (see later figures). The second can be solved by “flipping” the balun on the right. Normally one cannot flip a layout as they are not usually perfectly symmetric. For the balun, however, it is symmetric so you can flip it around the horizontal axis. (Ctrl-F then draw a horizontal line with your mouse and the part will flip around that line). In the layout, find the “Show Routing Properties” button in the menus and click on it. In the window which opens up set the default width to 0.6mm. Select one of the red lines Right-click and select Draw Route. Your cursor turns into a routing tool. Start from one end of the red line and go to the other end with as few bends and turns as possible. An example of routing is shown below. Note that your mouse cursor is snapping to the grids and that helps your determine the extension you need to go before you add a bend. It is suggested to have your view zoomed into the red line you are converting to a trace for better visibility. Notice that as long as your trace touches or covers the little red cross at each end of the connection, the trace will be fine. Particularly for the via, it is enough if you can get your trace to anywhere on the copper part of the circle. Once you are at the end of the route, double click and the red line turns into a trace. If you are not happy with your artwork, delete the trace and try again. An example of a compact layout is below. Since we treating all components as almost idea, it is important to reduce parasitics in the layout by keeping traces short. You now need to route the signals: IF, LO and RF. To do this, switch the layout mode to Path by the menu at the bottom (make sure you are in the layout window). The using the top menus: Options->Layout Options-> Tab Paths->Path width. Set to 0.6 mm. You can now click on one of the pads and free hand a routing for the signals. It is recommended that they be at least 8 mm long from the part and not over 12 mm. Once routed, you may notice they are a different color than the other copper traces. Select all the new paths, Right-mouse Click->Shape Properties->Tab Layout->Draw Layers set to CopperTop. The paths should now be the same color as the other copper nets/bias. An example is below. It is recommended that extensions of the ground via be added. It is OK to over a via as we are simply gong to hand drill them (you do not need to see them on the layout). Even further grounding can be applied around the part, along with markings of signals. The added ground allows the SMAs to connect ground on both the top and bottom, eliminating the need to drill a via. We have also aligned the LO and RF leads so that they are in a straight line. This will make final radio assembly easier. Signals are made by adding text, ensuring it is Copper Top, and then using Exclusive Or on the bottom tool bar in layout. (next to the T drop down on the bottom in the image above.) Font size is changed in the shape properties window (where you changed the letters to Copper Top). Add your name or initials. 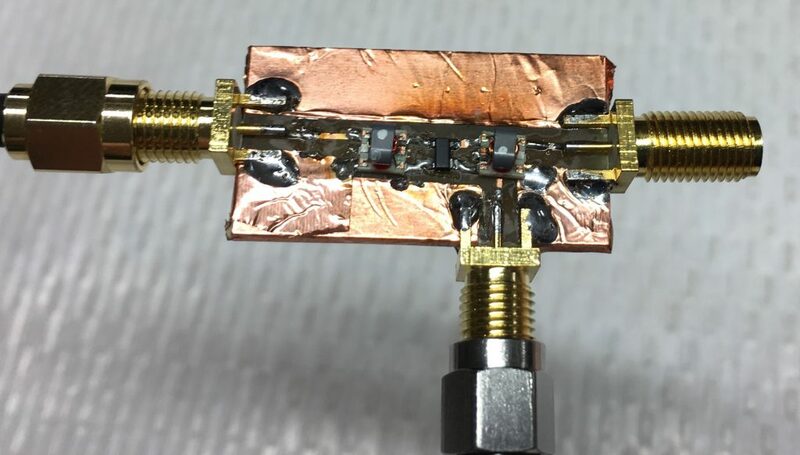 NOTE: Experimental results have shown that there is less LO coupling if the RF port is on the single ended side of the balun and IF is on the center tap. The layout maybe fabricated using an external PCB house or using the etching method described here. In the 1-day workshop and the online kit, a pre-fabricated PCB is provided, which requires assembly and connection of top-layer ground. Solder on 3 SMA connectors. Do not break off pins if you will use to solder top grounds together. Place baluns. Note – they are easy to place, they have two wires on one side and three on the other side. You can look at your layout and see the side with three connections. Place the balun accordingly. A picture of the LO balun is placed correctly in the image below. Place diode package. Since the mixer is symmetric, the diode will work in both directions as long as it is placed with its long side facing the balun (should face a 3-terminal side of balun). You can also use the layout as a guide and place the large pin on the upper left, on the LO side. Note the differential (top – three wires) and single ended (bottom – two wires) connections. In the 1-day workshop, you will be given pre-fabricated boards that contain the layout for the balun and diodes. An example board is below. You will add the copper top ground plane and connect to the back ground plane. Copper foil will be provided during fabrication. There is nothing to print or export for your design. The final mixer should look like this. Note that for radio assembly, the LO (left) and RF (Right) SMA connectors should be even with one another and be straight. The mixer has a custom test fixture shown below. Attach the LO cable to your LO terminal. Connect the IF to your IF terminal. 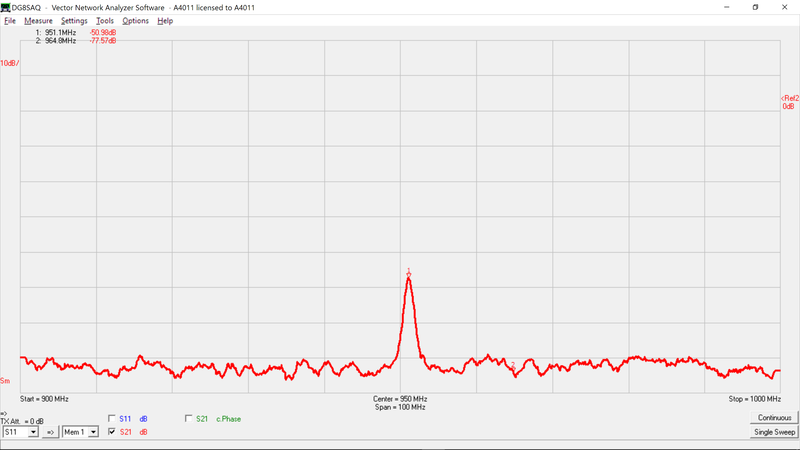 Connect the RF to the Spectrum Analyzer with a cable. 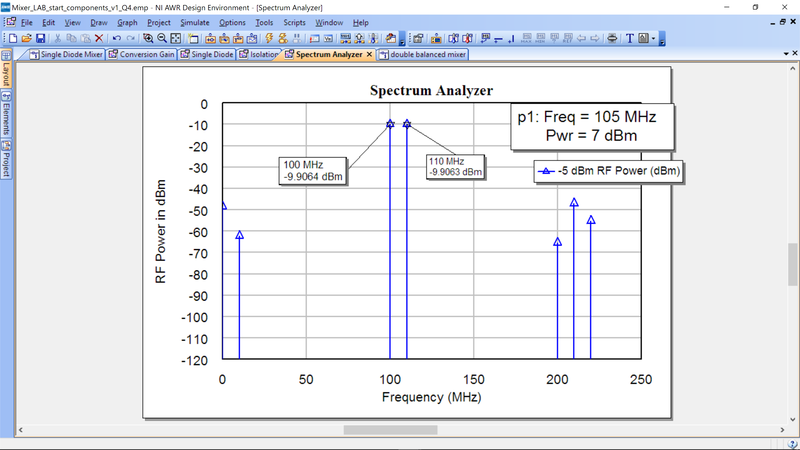 The instructor will setup the spectrum analyzer (SA) to the correct settings. On a calibrated SA, the LO suppression can be > 30 dB. 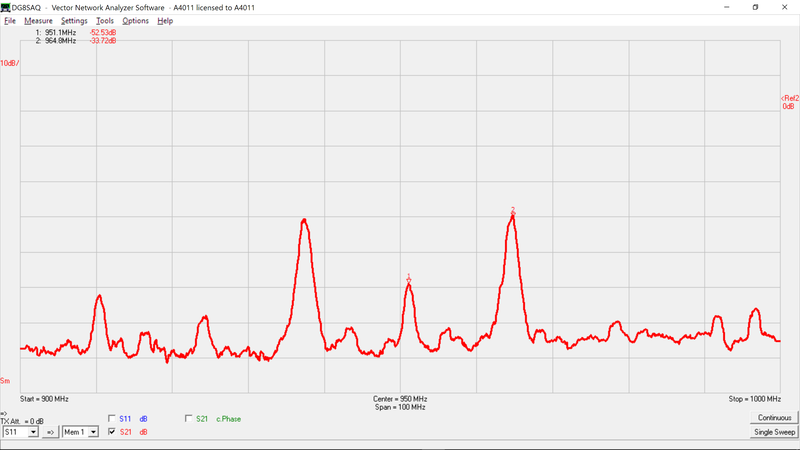 Here it is showing -50 dB, however the power is not calibrated on this pocket SA. Now turn the switch on to start the IF. Your results should be similar to those below. The RF output (signal) is approximately 20 dB higher than your LO. This is the benefit of the double balanced mixer. The other frequency components are due to our overdriving the mixer slightly. The IF power is – 7dBm, which is close to the LO of 0 dBm. Ideally, we’d like to be more than 10 dB below the LO for proper operation. 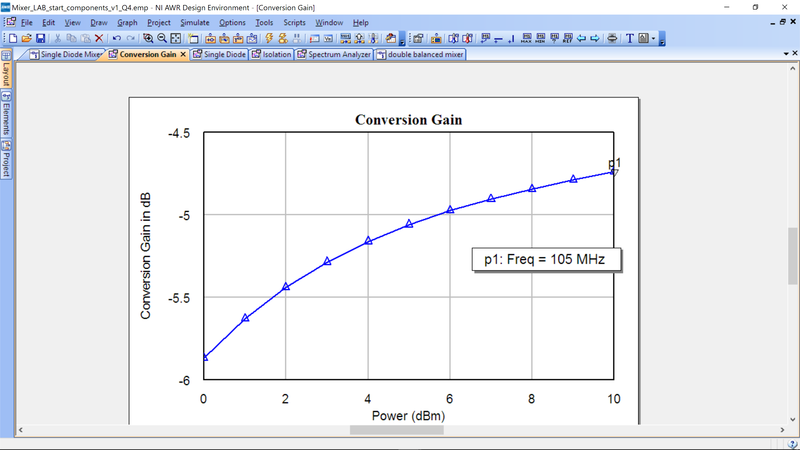 Using a calibrated SA, the conversion gain is typically -10 dB (a 10 dB loss) from IF to RF out.